Situated in the heart of Virginia's capital city, just minutes from Richmond International Airport, the 700,000-square-foot facility has enough room to swallow four football fields. The largest interior accommodations include 178,159 square feet of contiguous exhibit space accessible by an adjacent loading dock with 16 truck bays. The 30,550-square-foot Grand Ballroom is a showpiece featuring cherry wood accents, stained glass doors and adjustable lighting. The GRCC consists of 36 meeting rooms, including a 258 fixed-seat amphitheater with built-in hardwood stage and AV equipment. Visitors will enjoy the convenience of an on-site business center, Cyber Café and Visitors Center with Gift Shop on the first floor. The GRCC features complimentary wireless Internet in the Cyber Café and in all public lobby spaces. Additionally, three walk-up Internet-accessible kiosks can be found in the Cyber Café. 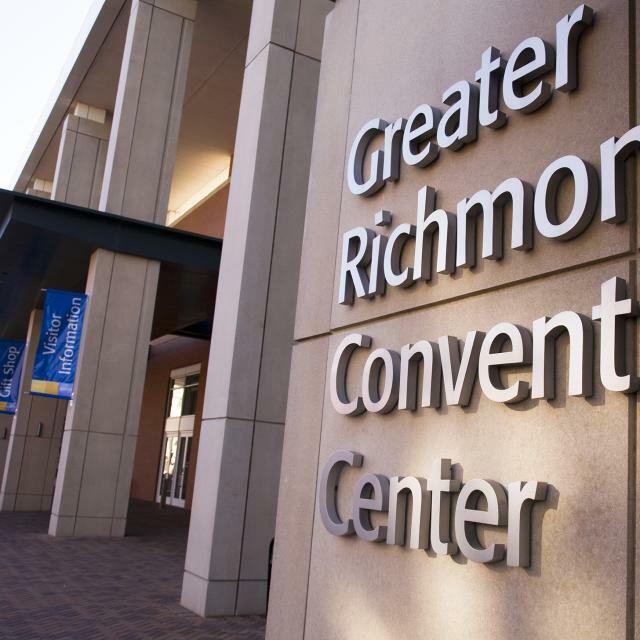 Call today to schedule a tour and find out why the Greater Richmond Convention Center is the best venue for your next event!